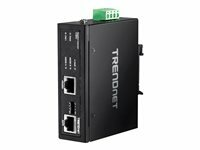 TRENDnet Industrial Switches. Hardened network switches for extreme environments and industry. 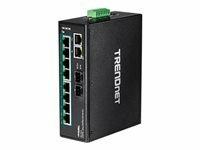 Full PoE+ power budget Supplies up to 30 watts of PoE/PoE+ power per port with a 120 watt PoE power budget. 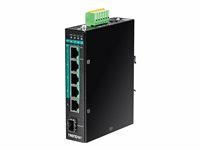 Integrated DIN-rail mount IP30 rated metal enclosure with integrated DIN-rail mounting hardware. Redundant power Dual redundant power inputs with overload current protection. Alarm output Alarm output is triggered by power failure of primary and/or redundant power. Jumbo frame Sends larger packets, or jumbo frames, for increased performance. Extreme temperatures Hardened switch is rated for an operating temperature range of -40 to 70 °C (-40 to 158 °F). Electro magnetic compliance Complies with IEC61000-6-2 EMC generic standard immunity for industrial environments. LED indicators LED indicators convey power, redundant power, alarm, SFP, and network port status. Grounding point Grounding point protects equipment from external electrical surges. 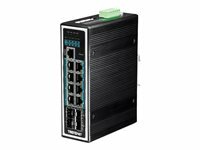 PoE power A 120 Watt PoE+ power budget supplies up to four Power over Ethernet devices with PoE+ power. Fault tolerance Features dual redundant power inputs (primary and RPS) from external power sources and an output alarm relay to indicate the event of input power failure. Industrial hardened design Equipped with a rugged IP30 rated enclosure and designed to withstand a high degree of vibration, shock, protection against ESD / EMI / surge, and operate with a wide temperature range (- 40 – 75 °C (- 40 - 167 °F)) for harsh environments. 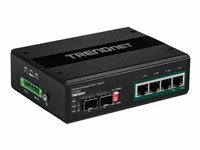 PoE power A 60 - 120 W PoE+ power budget supplies up to four Power over Ethernet devices. Fault tolerance Features dual redundant 12 - 56 VDC power inputs with output alarm relay. Industrial hardened design Equipped with a rugged IP30 rated housing designed to withstand a high degree of vibration, shock, protection against ESD/EMI/surge, and operate within a wide temperature range of -40 - 75° C.
PoE power A 240 W PoE+ power budget supplies up to eight Power over Ethernet devices with PoE+ power. Fault tolerance Features dual redundant power inputs with output alarm relay. Industrial hardened design Equipped with a rugged IP30-rated enclosure and designed to withstand a high degree of vibration, shock, protection against ESD/EMI/surge, and operate with a wide temperature range for harsh environments. 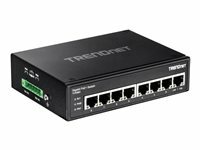 Integration flexibility Managed features include PoE control, IP static routing, access control lists, VLAN, IGMP snooping, QoS, RMON, SNMP trap, and syslog for monitoring and flexible network integration. 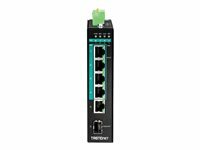 Fault tolerance It features dual redundant power inputs from external power sources and an output alarm relay to indicate the event of input power failure. 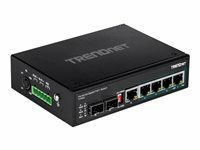 Ultra PoE A 240 watt PoE power budget supplies up to four Power over Ethernet devices with PoE (15.4 W), PoE+ (30 W) or Ultra PoE (60 W) power. Industrial hardened design Equipped with a rugged IP30 rated enclosure and designed to withstand a high degree of vibration, shock, protection against ESD/EMI/surge, and operate with a wide temperature range (- 40 - 75 °C (- 40 - 167 °F)) for harsh environments. Integration flexibility Managed features include PoE per port control/priority/scheduling/power delay, IGMP snooping, per port bandwidth control/802.1p/DSCP/queue scheduling, and SNMP trap/RMON/SMTP alert/syslog/port mirror for monitoring and flexible network integration.